I didn't know how to feel about the news that Netflix was bringing in an animated series based on a Sanrio character who loves death metal, but it seems like almost anything is possible these days, especially when it comes to possible Netflix investments. 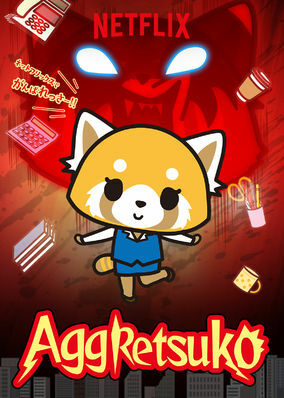 Enter Aggretsuko, who is precisely that. How this character designed for cuteness was given the odd background of her rather extreme musical tastes. I wasn't sure what kind of a story they could craft out of that one quirky character description, but hey it's fun to be wrong at times. The first season of this show is pretty short given each episode is only about 15 minutes long. I thought that it would just be random, episodic kind of stuff, but somehow they managed to craft a particular story arc for her that spans the entire brief season. It's crazy but rather clever at the same time and I was surprised at how much I enjoyed it. Synopsis: Aggretsuko or Aggressive Retsuko is a Netflix animated series written and directed by Rarecho. Rarecho had also directed 100 anime shorts that originally aired on TBS Television in Japan. In this anthropomorphic world, Retsuko (Erica Mendez) is a red panda office worker who has been at the same company for the past 5 years. She's a bit of a pushover and is regularly bullied by other folks at the office. Chief among them is her pig boss Ton (Josh Petersdorf) is a bit of a chauvinist who makes her do menial tasks and pushes extra work on her. Her only escape is the local karaoke joint where she goes alone to sing death metal. But things may change when her feline high school friend Puko (Allegra Clark) proposes they get into business together. This inspires Retsuko to consider finally quitting. But this glimmer of hope leads to some reckless behavior including ranting about her job during a man on the street interview with a local TV station. Even though her face is digitally altered out, it's pretty easy to tell it's her and Ton is onto her simmering passive aggressiveness. What I Liked: At first the whole death metal thing just felt silly but it rather grew on me - especially when Retsuko's doormat personality somehow earned her two new friends who ended up joining her karaoke nights. This is definitely one of those spirit animal moments where that desire to let out all your frustrations with the world through loud music is something that a lot of people can relate to. But more importantly this series actually has a rather quirky yet coherent story told in very short chapters. I guess all Rarecho's work on the original shorts helped him find his pace for telling these stories. You'd be surprised at how much happens in each episode despite the brevity and it's all often rather relatable content. What Could Have Been Better: Retsuko is a hard character to cheer for since she is a super pushover initially. It certainly gives her an arc throughout the season but even there's a lot of backsliding and it takes her a while to get moving. I know it helps heighten the irony of her death metal venting but it gets tiring at some point. And then the Resasuke (Max Mittelman) arc towards the end was really sad. I know Retsuko is rather pathetic at times and her eagerness to meet someone can make her and other people do silly things. But that arc was rather disappointing and I wish it hadn't had dragged on for as long as it did. But hey we can't choose everything. TL;DR: Aggretsuko is a crazy little animated series and I'm eager to see where things will go from here. Retsuko is the sort of underdog who makes it easy to root for her once she starts belting out the heavy metal but she has a long way to go. Thus the first season gets a rocking 5 instances of Retsuko finally standing up for herself out of a possible 5.